The court organist Antonio de Cabez�n, who was appointed to Queen Isabella�s court chapel in Toledo at the young age of 16, was rightly regarded by his contemporaries as the leading Spanish organist and keyboard player of the 16 th century. His hymns and versets are based on short, decorated harmonisations of the psalm tones. In the tientos, the transformation from vocal motet style to a style of writing suitable for keyboard instruments is perfectly executed. 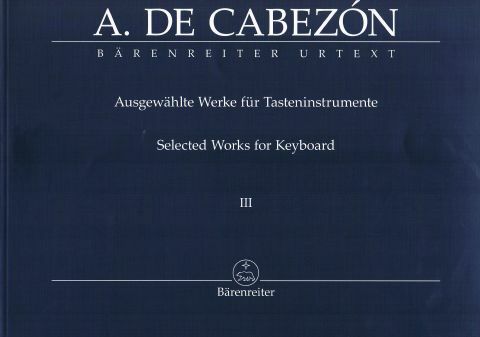 This Urtext edition contains a selection of Cabezon�s best known works and will consist of four volumes. It has been prepared by two editors working at Portuguese and Spanish universities who are both leading scholars of the works of Cabez�n and reflects the latest research findings. 35. Romance "Para qui�n cri� yo cabellos"
36. Canto Ilano glosado de "La Alta"
47. Himno "Ave maris stella"
48. Comunio "Beata viscera Mariae"